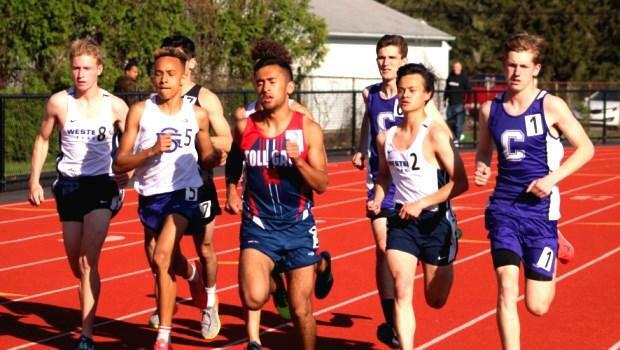 With the State Meet less than three weeks away, several athletes proved their peaking at just the right time for prosperity at Monday's inaugural Sgt. Brian St. Germain Invitational. Classical's Jacob Furland came a mere quarter of an inch from the No. 2 throw in the country in the hammer. Furland won the event with a heave of 216 feet, 5 inches (US #3). La Salle's Cameron Croce also exceeded 200 feet with a distance of 207-2 (US #4). Croce took gold in the shot with a throw of 53-7. Classical's Conor Murphy led from virtually the opening gun of the 1,500-meter run. The talented sophomore already held a sizable lead over the chase pack by the time he reached the 800m mark and finished with an outdoor best of 4:06.26. Toll Gate's Nikolas Reygadas was second at 4:10.28. Classical's John O'Rourke secured third in 4:10.95. Mount Pleasant's Abraham Tambah was a double-winner. Tambah edged North Kingstown's Andrew Whitney in the 100m dash with both timed in 11.17. About an hour later, the Kiltie sophomore claimed the 400m title, taking control on the final straightaway and finishing with a time of 50.42. Westerly's Ryan Holloway was second in 50.88. Roger's Ian Hall improved on his state-leading best in the javelin by more than eight feet with a heave of 183-11. La Salle's quartet of Jamari Jenkins, Abdul Sankorn, Alex Nuahn and Jolon O'Connor registered a state No. 2 in the 4x100m relay, combining for a winning time of 43.47. North Kingstown went 1-2 in the 800m run with Jack Perreault taking the prize in a season best of 1:57.43. Junior classmate Sam Toolin was second in 1:58.91. Rogers' Graeme Clougher was third at 1:59.93. Perrault cruised to an opening 400m split of 57 seconds with Toolin resting on his shoulder. He was able to break away from his Skipper teammate down the final straightaway. Bishop Hendricken dominated the 3,000m with four of the top six places. But it was St. Raphael's Reilly Johnston that snared the victory, crossing the line in 9:14.63.